With Renault winning the opening two rounds of the season, thoughts go back to 2003, when McLaren started the season with two wins. Back then the Woking team ended up third in the Constructors' Championship and Ferrari went home with both titles. Obviously the situation for the Italians is a bit different this year. While Rubens Barrichello is in exactly the same position he was in 2003, namely tied for third with eight points, Michael Schumacher is six points down on where he was after two races in 2003. For the rest things look eerily similar. Young talent leading with 16 points, teammate following with ten, then a large group with eight. Obviously Ferrari's bad performance this year is subject of much conversation. However, the points are still flowing in, keeping the team's run of now 33 consecutive races in the points alive. Come to that, reliability is clearly key for the Maranello team. In the last 121 races it happened only three times that no Ferrari finished in the points. If last year's race in Bahrain is anything to go by, Ferrari's comeback could be imminent. In the first race in the small oil kingdom they scored a dominant one-two from first and second on the grid. However, this time around they're faced with a car that hasn't been tested in actual race circumstances. Additionally there's also the Michelin problem for the Scuderia. The French tyre maker appears in excellent shape after having scored the first all-Michelin podium since Hungary 2003. Toyota aren't such regular scorers yet. The team scored their first podium in Malaysia. Of the current teams that makes them the slowest bar Minardi to reach their first podium. With 53 races, the team of Jarno Trulli and Ralf Schumacher took three races longer than Jordan. Minardi and Red Bull are still without podium after respectively 323 and two races. Before last year's Bahrain Grand Prix, only one race had been held in Asia in April. The race took place in 1994 on the TI Aida circuit in Japan under the Pacific Grand Prix moniker. Situated in a hard to reach part of Japan, the circuit was a small 3.7 kilometer track full of tight corners. The first of two races driven there was the second round of the 1994 Championship. First qualifying showed Ayrton Senna in the Williams as quickest, followed by Benetton driver Michael Schumacher and Damon Hill in the other Williams. After the first three there was a one second gap to Mika Hakkinen in the McLaren, who was just ahead of Gerhard Berger in the Ferrari. 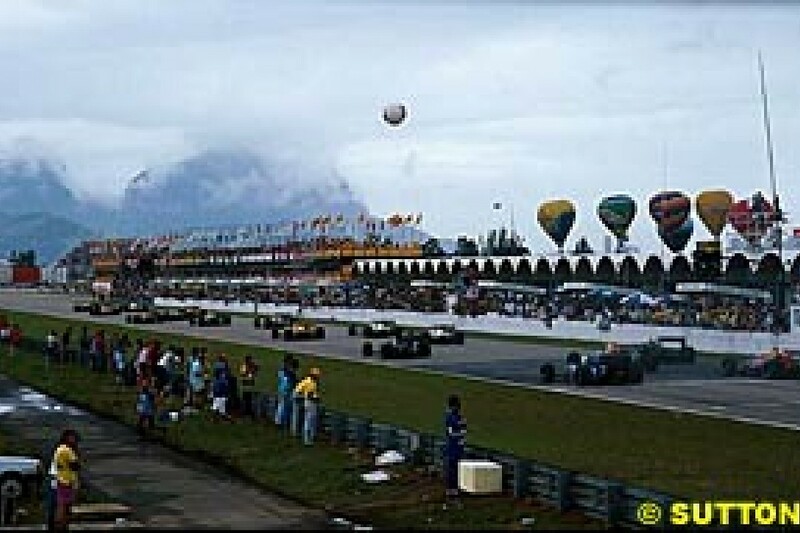 Despite the short track, with Senna running just over 70 seconds in his provisional pole lap, the majority of the field was over two seconds back. On Saturday times were a lot slower than on Friday and thus Senna spinning off didn't have any impact on the grid. Both McLarens even elected to stay in the pits, something Ferrari driver Nicola Larini, who was replacing the injured Jean Alesi, wished he'd done. Larini was torpedoed by Tyrrell driver Ukyo Katayama when the latter spun in an attempt to overtake the Ferrari. At the start Schumacher got the better of Senna, leading the Brazilian into the first corner. Unfortunately that's as far as Senna got. McLaren driver Mika Hakkinen braked late and punted the Williams driver off into the gravel. In the mayhem Ferrari driver Nicola Larini also spun off, hitting Senna and putting the Brazilian deeper in the gravel. While the race was over for Senna, Hakkinen continued in second, ahead of Damon Hill and Gerhard Berger. 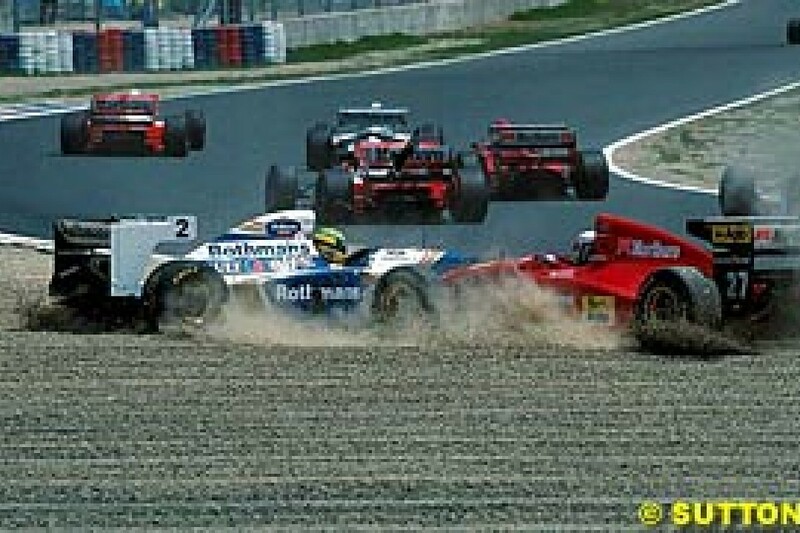 With Hakkinen in the way of Hill, Schumacher had in fact an easy time running away from the pack. While Hill was clearly faster than Hakkinen, the circuit hardly allowed for overtaking. In the fourth lap Hill gave it a go, but the McLaren closed the door and the Briton spun on the kerb. By this time Schumacher was six seconds clear of Hakkinen, who had a lead of five seconds over Gerhard Berger, who was unable to attack. When Hakkinen dropped out of the race with hydraulic pressure problems shortly after his first pitstop, the race was already more or less in the bag for Schumacher. On a quarter of the race, the German already was an astonishing 37 seconds ahead of his closest follower. While Hill was able to match Schumacher's pace once he had fought his way back to second place, the difference had already grown to over 40 seconds. After 50 laps Schumacher could really ease off the throttle as Damon Hill retired with gearbox problems, leaving Berger in second place over 50 seconds adrift. Over the last quarter of the race everyone appeared to take it relatively easy, since the gaps were big and the cars were suffering from the heat and thus after 83 laps everyone was happy the race was over and done with. Only Berger remained on the same lap as Schumacher, but only just. Third place was for Jordan driver Rubens Barrichello. While we're on to round three of this year's Championship, the 1988 season didn't start until the first week of April. The circus arrived in Rio with some notable changes from the previous year. Ayrton Senna had left Lotus to join McLaren, while World Champion Nelson Piquet had moved from Williams to Lotus. With Senna, Honda also joined McLaren, leaving Williams opting for Judd engines. In first qualifying Ayrton Senna already brought cheers to the home crowd by annihilating the opposition. The Brazilian clocked a time seven tenths quicker than Nigel Mansell in the Williams and no less than 1.5 seconds quicker than number three, Alessandro Nannini in the Benetton. Behind the Italian it was Senna's teammate Alain Prost, followed by Thierry Boutsen in the second Benetton and the two Ferraris of Gerhard Berger and Michele Alboreto. Piquet had to settle for a disappointing eight position, over 2.5 seconds slower than his countryman on pole. On Saturday the track was a bit quicker, rendering Friday's results useless. Only Nannini was unable to improve his time. The front row remained unchanged, though. Senna and Mansell were now followed by Prost, Berger and Piquet. However, things did change after the parade lap on Sunday when Ayrton Senna found himself stuck in first gear. The start was abandoned and the polesitter was forced to start from the pitlane. When things got underway, it was Alain Prost in the other McLaren who made the most of the start. The Frenchman took the lead with Gerhard Berger behind him, followed by Mansell and Piquet. Meanwhile Ayrton Senna had jumped into the spare car and was on his way from the back of the grid. In the opening laps the Brazilian fought his way up, while his teammate ran away at the front. After five laps Prost had a gap of nearly six seconds to Berger, who in turn was five seconds ahead of Mansell. As the race progressed, Berger steadily lost ground to Prost. By the time the Austrian stopped for his first pitstop, the gap had grown to 20 seconds and Prost had nothing to fear at all. Senna meanwhile was going through the field like a hot knife through butter. By lap 13 the McLaren driver found himself back in the points and when Berger pitted after 20 laps, Senna was second behind Prost. However, ten laps later he was forced to pull into the pits. His jump into the spare car was against the rules and the Brazilian was disqualified. Behind Prost the field was starting to run thin as many teams had problems with engines overheating, most notably Williams, who had both cars retire before the halfway point. Halfway through the race Berger was back in second, 16 seconds behind Prost. 25 seconds behind Berger it was Piquet and Alboreto, followed by Thierry Boutsen. While Gerhard Berger fought hard to catch Prost, the gap the Frenchman built in the early stages of the race proved to be enough. The surprise in the second half of the race was Derek Warwick in the Arrows, who managed to catch up with Piquet and Alboreto and even overtook the Italian to claim fourth place. The final point went to Piquet's teammate Satoru Nakajima, who finished a lap down.